The romantic comedy Sleepless in Seattle popularized a faux statistic about age and the single woman, saying “a single woman over the age of 40 has a greater chance of being killed by a terrorist than of getting married.” Another equally invalid urban myth relates to age and the entrepreneur. Reading Valleywag you’d think that the only entrepreneurs are Digg-style party animal 20-something year olds. Or, if you really want to feel over-the-hill, consider the 12-year-old Jason O’Neil, profiled here by Forbes. While I have no problem with young entrepreneurs, I think the media — in its disproportionate coverage of them — creates the mis-impression that if you over age 30 then you have a greater chance of being killed by a terrorist than of starting a company. So I was happy to find this post on Infectious Greed that brought some data to the problem. 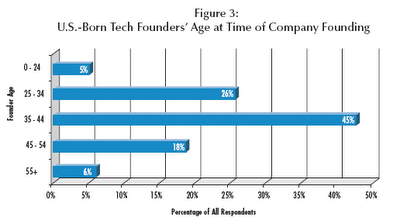 Perhaps surprisingly, the report shows that U.S. tech entrepreneurs are, if anything, older than expected. People founding tech companies over the last ten years had an average and median age of 39-years, nowhere near the age that makes for good stories about dorm room entrepreneurs — and older than many of us might have thought. I would think some of this demographics results from the ups and downs in the tech industry – older, higher paid employees may be first to get laid off when there is a downturn, or to get disillusioned and go out on their own, and the last 10 years has had its share of ups and downs.